In the Wilderness the central sanctuary was the Tabernacle, in Jerusalem the Temple. When the Reform movement came into being it tended to call its houses of worship “temples”, partly because this was the Continental Protestant term for a sanctuary (in Hungarian the word was “Templom”). Orthodoxy opposed the use of “temple” for a synagogue, pointing out that there was a vast difference between the terms “temple” and “synagogue”. Not only did the sages say that there was at least one synagogue in the Temple complex, which already indicated a difference, but the focus was not the same. In the synagogue the focus was on study: in the Temple it was ritual. Judaism needs both. Judaism requires deeds as a mark of commitment; it also requires study as a means of understanding and shaping the spirituality. 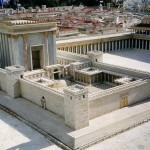 A further difference was architectural: the Temple in Jerusalem was a grand, impressive edifice, whilst the synagogue was usually a humble, unadorned utilitarian edifice where the grandeur was not in outward appearance but inner spirituality.